The Sustainability Transition Lab (STL) process builds on the latest research and practice in creative collaboration. Drawing on approaches such as Change Labs, Design Thinking, Theory U, the Framework for Strategic Sustainable Development and Collective Impact, the process is designed to foster deep learning, bold action, and unconventional partnerships and collaboration. The Framework for Strategic Sustainable Development brings robust sustainability science and a strategic approach to underpin the process, while the application of Theory U infuses deep learning, dialogue, awareness and creativity to guide collective action. We draw on the Collective Impact model for guidance on how to create structures that work in the context of organizations working together. The process is intended to establish a shared vision of success, a methodical approach to creating value for all participant stakeholders, and breakthrough results that lead to systemic change. Each Sustainability Transition Lab project will be different, depending on the problem domain, scope and scale, and the priorities of the co-convenors and participants. However there are certain generic elements that have been designed into four core phases of the Sustainability Transition Lab. 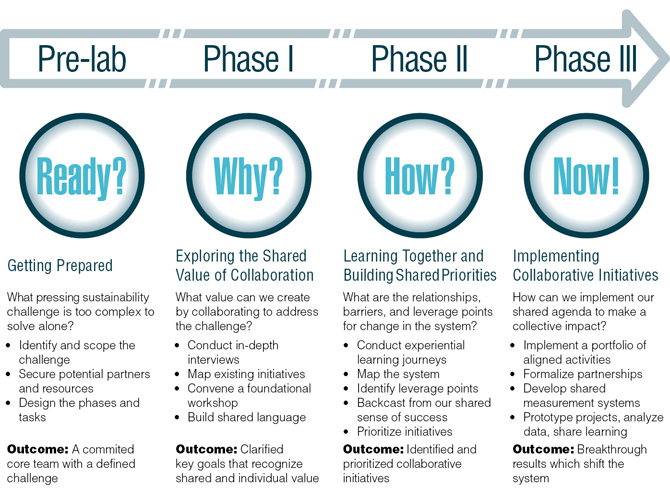 The image below outlines the overall Sustainability Transition Lab process in broad strokes. Note that while the image above depicts a linear process, in practice the phases will rarely be so clear-cut or the process so straightforward. Collaboration is often messy, and we anticipate continuous development and iteration as the activities of a Sustainability Transition Lab unfold. Based on the general design above, the co-convenors work together to specify a design for the Sustainability Transition Lab that is well-suited for the particular organizations and conditions involved. The phased approach honours the need for participating organizations to continuously assess the value of their participation, and for the group to make considered decisions on where they are going together.